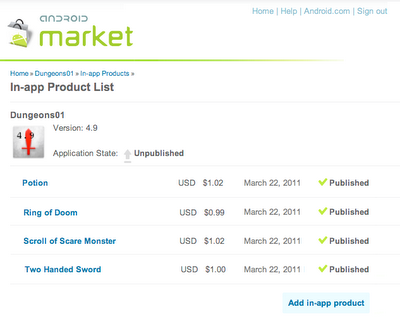 Back in January we announced our plan to introduce Android Market In-app Billing this quarter. We're pleased to let you know that we will be launching In-app Billing next week. In preparation for the launch, we are opening up Android Market for upload and end-to-end testing of your apps that use In-app Billing. 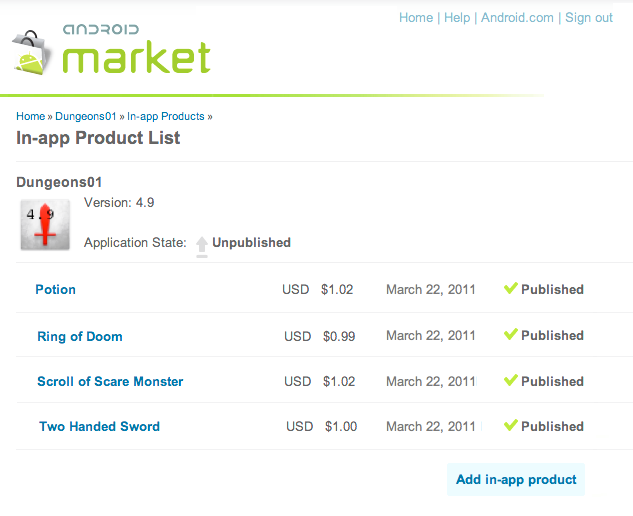 You can now upload your apps to the Developer Console, create a catalog of in-app products, and set prices for them. You can then set up accounts to test in-app purchases. During these test transactions, the In-app Billing service interacts with your app exactly as it will for actual users and live transactions. Note that although you can upload apps during this test development phase, you won’t be able to actually publish the apps to users until the full launch of the service next week. To get you started, we’ve updated the developer documentation with information about how to set up product lists and test your in-app products. Also, it is absolutely essential that you review the security guidelines to make sure your billing implementation is secure. We encourage you start uploading and testing your apps right away.